As John suggested in his post this morning, he and I have been working with Ben Highton of UC Davis to develop some predictions for congressional elections. We’re taking a very particular approach here: we want to know how far the “fundamentals” of elections can get us toward an accurate read on congressional outcomes. By fundamentals I mean anything that is largely unaffected by the back and forth of the fall campaign in each district. We developed a model that includes two types of fundamentals: 1) national factors like the economy that affect every race to some extent, and 2) district-level factors like whether an incumbent is running for reelection. 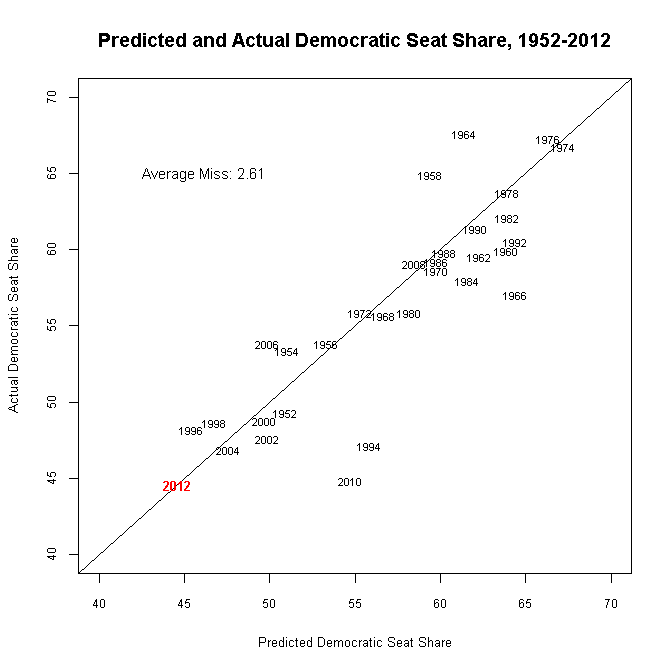 We then ran this model for all House elections from 1952 through 2010, and predicted 2012 from that. The bottom line: our model predicts Democrats will win 194 seats (44.6%), one more than they currently hold, with a one in four chance that they will take back the House. Democrats do better in terms of vote share—48.9%, or almost two percent more than they got in 2010—but the extra votes don’t make a difference for the expected seat gain. When building such a model for congressional elections, there are a couple of general approaches. First are predictions that use only national-level fundamentals. There were several such models (gated) for the midterm House election in 2010. The second approach is handicappers such as Charlie Cook and Congressional Quarterly, which take a race-by-race approach. This offers invaluable information about those races, but it also incorporates information other than the fundamentals, and it can sometimes make it hard to know how the broader political winds are blowing. A few models from 2010—for example, 538 Blog, or Bafumi, Erikson, and Wlezien (gated)—offered a mix of these approaches, relying on both fundamentals and handicapping/polls. GDP: change over the previous two quarters, measured at the second quarter of the election year. Presidential approval: from Gallup, as of June of the election year. An indicator for midterm elections: to capture the typical seat and vote loss for the president’s party. The party of the president. These factors are similar to the presidential prediction model John, Lynn Vavrek, and Seth Hill created for the Washington Post. Incumbency: Republican incumbent / open seat / Democratic incumbent. Incumbency captures the well-known boost that incumbents get (for a variety of reasons), while the presidential vote captures the underlying partisan complexion of the district relative to others. Both variables also tell us something about a party’s “exposure”: how many seats it holds, and how many it probably should not hold. The model’s predictions are quite accurate, missing the actual result by an average of only one percentage point. It’s worth noting that the predictions are still pretty good if we base our model on 1952-1992 and predict 1994-2010 off that. So the basic dynamics of House elections have been reasonably stable over this period of time, at least once they’re aggregated to a single national number. The prediction error is worse for seats. The model is especially bad in big swing years like 1958, 1964, 1966, 1994 and 2010, when it tends to understate the successful party’s performance. That’s not because it gets the vote wrong: the vote prediction is pretty close for all those years. Instead, it’s more likely that a bunch of close contests broke the winning party’s way, greatly expanding the gains over what the model expected. Since 2012 is probably not going to be a big swing year, we might have a little more confidence in the prediction this time around. Nonetheless, that means if Democrats can eke out some narrow wins in key districts, their performance could be a lot better than expected. Republicans are very “exposed,” in the sense that they hold a lot of seats, many of them in uncomfortable territory, and this year will likely be a better one for Democrats than 2010. Containing losses is clearly the name of the game for the Republican party. Models that take into account the ongoing dynamics of individual races—either through spending, polls, or general handicapping—might do a better job of picking up that sort of development. One last thought. It’s hard to miss the 5-point gap between vote and seat share in 2012. This gap is not uncommon in House elections, but it is on the high side (the average gap over the past 60 years has been about 3 points). Why is there such a gap this time around? Could it be the redistricting? Or something else? We’ll address that more directly in a future post, so stay tuned. *Because we include both national and district-level factors, we run a multi-level model with random intercepts for years and districts. **The careful reader will note that we don’t really have a pure forecasting model, since we use the contemporaneous presidential vote in our model (e.g., the 2008 outcome is predicted with the 2008 presidential vote, the 2004 outcome with the 2004 vote, etc.). We do it this way because it minimizes the number of elections where using the last presidential vote would cross a redistricting year. Nonetheless, it’s a legitimate concern. It’s partly why we use the mean-deviated presidential vote: we’re trying capture how partisan a district is relative to other districts, which is something that changes less over time. To be safe, in years where the last presidential election didn’t cross a redistricting, we compared our predictions to predictions using the last presidential vote (for example, using 2004 to predict 2008). The predictions were virtually identical. Who’s Ahead in the Presidential Ad Wars? 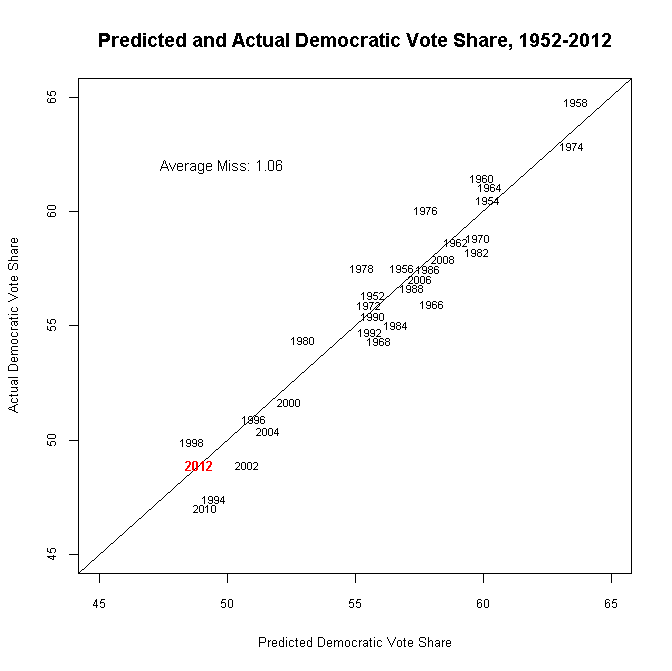 Are you telling me that Dems have the lowest share of the vote that they have had in over 50 years? It seems that way. The Democrats held the House for 40 years up until 1994, and then they’ve held it for only 4 more years (2007-2011) after that. My forecasts simply use the regression coefficients from Table 6.2 of Gary Jacobson’s Congressional elections book (8th ed), which are based on 1946-2010 Congressional elections. Using his model, we’d predict Democrats to pick up 25 seats, giving them 218 out of 435 seats. Dems with 218 would be awesome. That would so close with some Blue Dogs defecting that Pelosi wouldnt have a chance at being Speaker. Also with the GOP losing control, hopefully theyd dump that crying loser Boehner. As a conservative, Id rather the Dems have 218 than the GOP have 218. I can just see Boehner cutting deals left and right with Reid and Obama. Let the Dems have it all when Bernanke’s wreckless QE comes due.